The Edwards 7633 Series Corridor Dome Stations are used to visually and audibly indicate the placement of calls from a connected pull station. Stations are available with 2 or 4 lamps; the domes are designed with barriers between the lamps to prevent visual interference of signals. 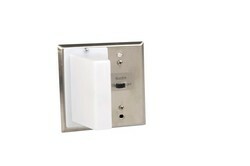 The 7633 mounts in a standard double gang box with a plaster cover and a minimum depth of 1 3/4" (44mm). Boxes and plaster covers not supplied.